Unless otherwise specified in connection with particular offerings, participation in the Service is open only to natural persons who are 13 years of age or older. Employees or agents of KOLA-FM, Triton Loyalty, and each of their respective affiliates, and immediate family members of or persons domiciled with any such persons are not eligible to participate. In consideration of your use of the Service, you agree to provide true, accurate, current and complete information about yourself as prompted by the registration form and to maintain and promptly update your personal data to keep it true, accurate, current and complete. If you provide any information that is untrue, inaccurate, not current or incomplete, or if we or any of our service providers have reasonable grounds to suspect that such information is untrue, inaccurate, not current or incomplete, we have the right to suspend or terminate your account and to refuse any and all current or future use of the Service (or any portion thereof) by you. You may not register with a disposable email address. Only one member account per person and two member accounts per household. If you are 13 years of age or under you cannot post information about yourself on the website or complete the registration process. You can, among other things, review your accumulated Points, review the Terms and Conditions as amended from time to time, and review redemption options at club.kolafm.com . This sweepstakes will begin on 6/14/2018 12:00 AM PT and all entries must be received by 7/13/2018 5:00 PM PT. You currently have 0 entries. Winner must provide Anaheim Broadcasting (the company) with a current, valid government issued California identification and a valid taxpayer identification number or social security number before any prize will be awarded. Any person winning over $600 in prizes in a calendar year from The Company will receive an IRS Form 1099 at the end of the calendar year and a copy of such form will be filed with the IRS. *Prize money in any denomination will be in the form of a check. Allow 6-8 weeks. Any potential winner, even if announced, is subject to verification. If potential winner does not meet all requirements, no prize will be awarded regardless of any announcement of a winner's status. All contestants (qualifiers) must be at least 21 years of age AND a licensed driver with a valid California Driver’s license. KOLA 99.9 FM is not responsible for the inability of the listener to enter through technical, mechanical, or other errors associated with entering said contest. Employees and agents of KOLA 99.9, Anaheim Broadcasting and their families, their advertising agencies or representatives including employees and family members of employees of Riverside Harley-Davidson are ineligible to enter this contest on KOLA 99.9.
www.kolafm.com. KOLA Online Advantage Club Members may have access to winning information during this contest that may or may not be announced on air. No purchase necessary to join. Additionally, members may have the chance to "enter to win" through other methods. a.There will be a maximum total of 99 keys, only one of which will activate the grand prize method of winning (“winning key”). The winning key will be awarded the prize in accordance with these rules regarding qualification of the winner and claiming the prize. The holders of the remaining 98 keys will be awarded no prize. One entry per person per household. i.On-Air drawings – 80 keys. KOLA will announce entrants into the grand prize event each weekday morning between 5:00am and 9:00am. Entrants will be randomly chosen the previous day from all those who have entered through the KOLA Online Advantage Club at www.kolafm.com. No purchase necessary to join the KOLA Online Advantage Club. ii.Off-air drawings – 19 keys. KOLA will randomly choose 19 entrants on Friday July 13, 2018 at 5:01pm from all entrants at that time in the KOLA Online Advantage Club who’ve entered into the contest. c.On Saturday July 21, 2018, check in time is 1:30p. Notified entrants must appear at Riverside Harley-Davidson at 7688 Indiana Ave, Riverside, Ca 92504 with a valid California Driver’s license and a picture ID to verify that he/she is the person who’s entry was selected and of legal age for the promotion which is 21 years old. Check in will be from 1:30pm – 3:00pm. Starting at 3:30pm, each of the maximum of 99 persons that qualify will receive a key selected at random through a process to be determined by KOLA. If one or more entrants of a preliminary or on site drawing is not present at the July 21, 2018 drawing by 3:00p, KOLA may conduct as many additional random drawings as necessary from entries received at Riverside Harley-Davidson on that date until a maximum 99 keys have been awarded. d.Only one of the keys will activate the grand prize and the person holding the operative key will be declared the winner. Once the key activates the grand prize, the contest is over. No other keys will be used in an attempt to activate the prize. Winner must be present to win. e.In the unlikely event that no key opens the lock, a random drawing will take place to award the winner. f.Prize consists only of the item specifically listed as part of the prize and does not include additional options, license, insurance, title, registration fees and taxes. 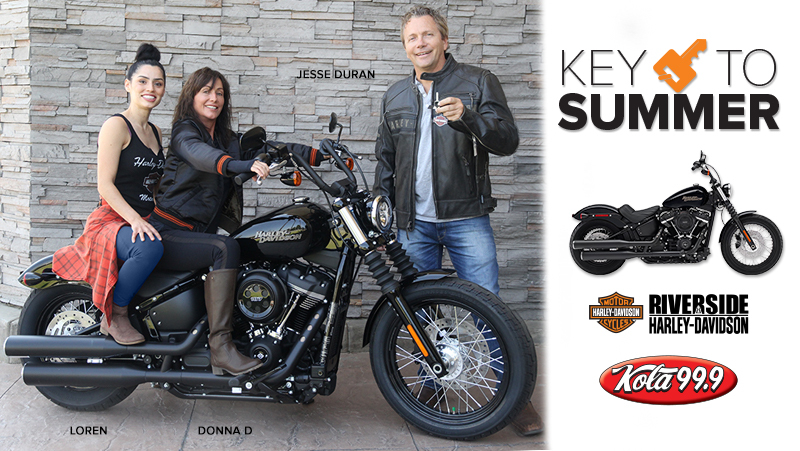 Winner must take delivery of prize as designated by Riverside Harley-Davidson. Winner must have a valid driver’s license and satisfy applicable proof-of-insurance laws to take delivery of prize. Riverside Harley-Davidson may award the amount of $5000 (five thousand dollars) as a substitute grand prize. This arrangement is solely through Riverside Harley-Davidson. The contest is an "exception" to the 1 prize per calendar month rule. That is, a person may win 1 other prize during a calendar month and will still be eligible to qualify once total with the “Key To Summer" contest. Whichever method of qualifying (on air or online or sponsor drawing), a person may only qualify once PER HOUSEHOLD for the Grand Prize Event. The grand prize winner is responsible for all taxes (and registration fees) and fuel and insurance costs associated with the prize.